Few singers have as recognizable a voice as James Blunt. His crooning melodies have made him a vocal sensation around the world with a total of more than 18 million albums sold worldwide. Born in Tidworth, England, Blunt spent much of his youth traveling around Europe because his father was in the British army. After graduating from University, Blunt spent six years in the British army, often performing for troops and local civilians while on duty. He left in 2002 with the intention of pursuing his music career. And today the 5-time grammy nominee is coming out with his third album entitled "Some Kind of Trouble." 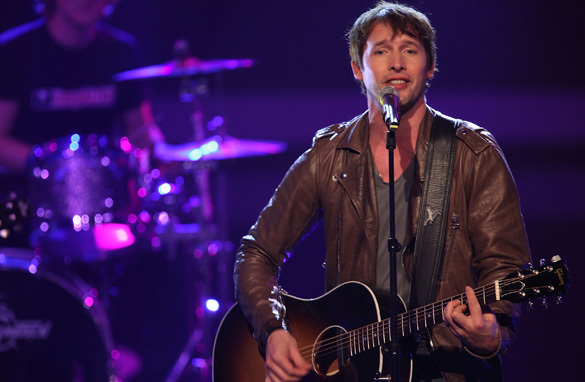 This is your chance to ask James Blunt your questions. What's his personal favorite song? Send in your questions and don't forget to tell us where you're writing from. Tell me, would you ever consider writing lyrics to a song that someone else wrote? Just in case let me know I own a vacation home next to Verbier and have a few things up my sleeve that I'm sure you would enjoy. Happy New Year to you and your loved ones !! James, did you really disobey an order while in Kosava regarding the Russians entering an airport, with the intention of overting world war 3, backed up by General Sir Mike Jackson? Are you working on another album? If yes, what was the greatest inspiration for it and what can we look forward to? How do you manage the responsibility (should you feel it) and your limited time in life to use your position of inspiration and influence through your music on the global stage, to commit yourself to improve the current state of the human civilisation to your maximum potential? How would you describe your musical journey so far through the three albums? What sort of music can we expect from you in future? And who is/are your inspirations, musically and otherwise? What songs means most to you and can you tell us why? Which artist out there excites you most right now? How do you feel about the current pre-emptive warfare major militaries engage in these days, as opposed to 'liberation operations' or rescue ops? I have nothing to ask James Blunt right now but I want him to know how much I love him. All his music are food of my soul. I listen to his music often to refresh my spirit. I want him to keep on singing in such style. Keep up the brilliant music, will you be coming out Cyprus in the near future? Take care & all the best for 2011 & may the years continue to be good to you. First Happy new year to you, I am from Gabon, and I live in South Africa. Us African we do love your songs, are you planning to organise a concert in 2 or 3 African countries? James, I am in Kosovo. What a messed up placed. Do you think NATO left this god-forsaken place in better conditions or worse? Have you ever been downhill skiing in Canada yet? If so... where? Alberta, British Columbia, ... If given an opportunity while touring (country & season) would you venture out & explore/ski different rocky mountain challenges in different countries? Have you ever been downhill skiing in Canada yet? If so… where? Alberta, British Columbia, … If given an opportunity while touring (country & season) would you venture out & explore/ski different rocky mountain challenges in different countries? What was it like hooking up with Petra? you lucky SOB. Hi James - I'm a Kosovan, and I would just like to extend my deepest gratitude for what you and all the other NATO servicemen and women did for Kosovo. Your music is also great. Keep up the good work! My question - I know you come to Kosovo a few years ago and performed for the soldiers, and also made a documentary of your experience after the war. Any chance you will put Prishtina as a stop in your future tours? I am a 9-years-old girl from France and I love your songs. I have got all your albums, and I find the last one very beautiful. Thanks to your songs, I learn english easily. Keep on writing and singing so wonderfully. I hope that your next album will come very soon. Do you plan to come and sing in France? I am Alice Mannu's twin sister, I am 9 years old and I live in France. I love your albums and I am very happy that you managed to make a third album ! In this album, my favourite songs are "Stay the night", "Dangerous" "best laid plans" and "Superstar". Could be please explain me why the twelfth song (which appears in the album) seems to be a silence, as if there was no song ? I would love to meet you one day. Dear James, could u plz tell some stories behind ur new album? such as " what was it that inspired u of writing a specific song?" or " what feeling do u have while playing a specific song in the new album live? " Dear James, I'm a fan from China. could u plz tell some stories behind ur new album? such as " what was it that inspired u of writing a specific song?" or " what feeling do u have while playing a specific song in the new album live? " –	How will your music improve our world? I am awaiting James Blunt’s replies.